Take a comfortable & relaxing 1 hour 20-minute flight with Airnorth from Darwin to Nhulunbuy. What awaits is an exciting, fun, off the beaten track, 4WD adventure to Bawaka, which means ‘A Known Heaven’, located 60km south of the community of Yirrkala. The drive is on a great four-wheel drive track of mainly soft sand, that comes out along the ocean. The very experienced and knowledgeable guide, Rungbar (otherwise known as Randy), shows off his land, the fishing, wildlife, beauty, traditional ways and history. The scenery is breathtaking, just being there will feel as though the world has been lifted from your shoulders. Upon arrival to Bawaka, a ‘Welcome to Country’ ceremony is performed by Indigenous Australian Elders to welcome visitors to their traditional land. The ceremony includes singing, dancing and smoke ceremonies. The ceremonies are performed as a form of blessing to be on country and to keep safe. Watch in awe as Rungbar masters traditional spear fishing and crab hunting. In no time at all, he will catch fresh mud crab and a few mullets and cook them on an open fire for a delicious, traditional lunch. A picnic lunch is provided but is generally supplemented with a seafood lunch as described previously. Your guide will take you by foot or in the 4WD to explore the area and point out certain plants and how when they flower what it means for their hunting season. You will learn about the seven seasons and what the environment is telling the YOLŊU people. 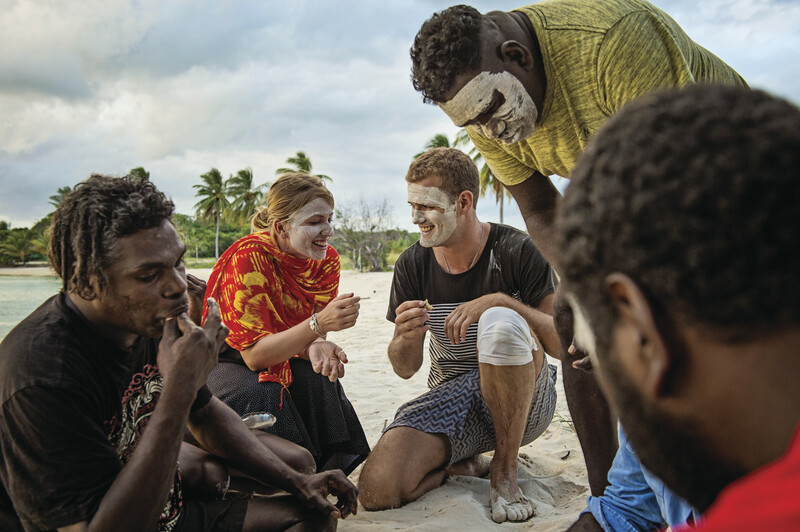 Learn about Moiety – Yirratja and Dhuwa (Kinship) and how this connects the Yolŋu people to the land and to each other, one big earth balanced. One of the many highlights is the visit to Lonely Beach, a magical and stunning place where you immerse yourself in the tranquillity, collect your thoughts, feel calm and privileged to be there. Bawaka is very photogenic so don’t forget your camera and ensure the battery is fully charged and embrace yourself for an amazing experience. This intimate and unique experience is available with Lirrwi Tourism, departing from Nhulunbuy or Yirrkala. To book please click here there are more cultural tours available with Lirrwi Tourism including an Art Tour - East Arnhem Land is well known for being home to many of Australia's most prized and accomplished artists, Gululu Day Tour - This one day tour of Nhulunbuy and surrounds, takes participants to a range of spectacular and culturally significant coastal locations in the East Arnhem Region. Whilst in Nhulunbuy you can base yourself at the Walkabout Lodge All guest rooms are air conditioned with ensuite and patio or balcony. The lodge has a fully licensed restaurant, open every day for lunch or dinner. Begin your stay in style with a cocktail by the shaded resort swimming pool and then get ready for adventure.